Rosacea can be a frustrating skin condition to live with. Flare-ups can happen often, and many times unexpectedly. If you or a loved one is affected by rosacea, it’s important to be well-educated on the symptoms and treatments of this skin condition, as well as know how to live and cope with it. Rosacea is a common skin disease we see very frequently in our offices. According to the National Rosacea Society, 16 million people—one in every 20 Americans—are estimated to be affected with rosacea. However, only a small fraction of these individuals receive appropriate treatment. Most likely, this is because rosacea is commonly mistaken for other skin conditions such as rashes, acne, and discoloration of the skin. In reality, rosacea is a skin condition that causes facial redness, papules, and pustules. Papules are small raised pimples that don’t produce pus. Pustules are red, pus-filled bumps. Rosacea commonly begins as the tendency to flush or blush easily. As it progresses into a more severe condition, you may notice those papules or pustules forming generally in the center of your face. As mentioned previously, only a small percentage of rosacea patients seek proper treatment. Studies revealed that 78% of Americans don’t know the symptoms or treatments for rosacea. Which is why, in many cases, those who have rosacea don’t even realize it. The best way to raise awareness for this skin condition is to discuss common symptoms of rosacea. 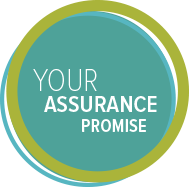 If you believe you may have rosacea, we recommend getting a professional opinion. 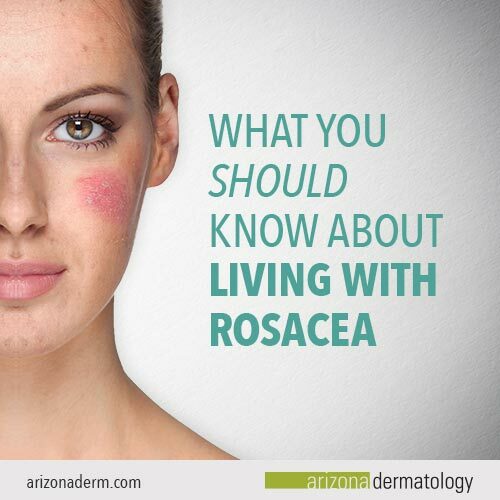 At Arizona Dermatology, we see rosacea quite frequently and can help you detect and diagnose even the earliest stages of this disease. Additionally, research suggests that rosacea runs in families who have previously encountered rosacea or severe acne. Studies have also shown that rosacea is more common in fair-skinned individuals. If you’re affected by rosacea, know you’re not alone and we’re here to help. Once you’ve been diagnosed with rosacea, our doctors will help you live comfortably with this skin condition. One of the ways we’re able to do so is by discussing the various elements that trigger your rosacea. Your rosacea symptoms will flare-up due to a wide variety of triggers. Triggers can include food, sunlight, or even water. However, what’s interesting about this skin condition is that each patient’s rosacea is affected by different triggers. Therefore, it’s important to work with rosacea experts to determine which elements are causing your flare-ups. 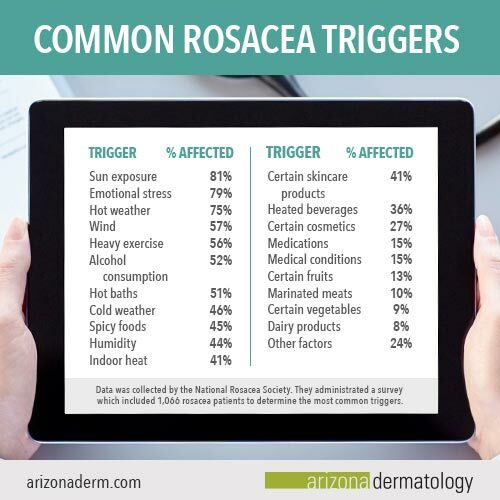 At Arizona Dermatology, our doctors will work with you to determine your specific triggers so you can avoid them whenever possible. To do so, we recommend setting up a consultation appointment. Unfortunately, there’s no cure for rosacea. But with appropriate treatment, most can control their symptoms and keep their condition from getting worse. The first aspect of rosacea treatments at Arizona Dermatology is behavioral modification. Behavioral modification is all about adjusting your lifestyle to the symptoms and triggers associated with this common skin condition. To do so, you’ll want to do everything you can to avoid your rosacea triggers. This will look different for each individual patient. For example, for those who experience flare-ups due to sun exposure, we’d recommend using sunscreen with zinc oxide and wearing a wide-brimmed hat. For others who see rosacea flare-ups from emotional stress, we’d recommend keeping stress levels at a minimum. For patients who experience facial redness and pustules from food intake, we’d suggest avoiding spicy meals and alcoholic beverages. As you can see, our recommendations for behavioral modifications will vary depending on what triggers your rosacea. You can receive a personalized behavioral modification plan by setting up a consultation appointment with one of our doctors. The second aspect of our rosacea treatments is prescription medication. Prescription medication can be very effective for maintaining discomfort and treating various symptoms. The primary medications we prescribe for rosacea fall into two different categories: topical prescriptions and oral antibiotics. Topical prescriptions are commonly used to treat mild to moderate rosacea cases. They’re effective for reducing redness, improving inflammation, and removing pustules. Some of the most common topical prescriptions we prescribe include Mirvaso, Metrogel, Finacea, and Ava. On the other hand, if you have a more severe case of rosacea, we may prescribe oral medication. Our oral prescription medications contain powerful anti-inflammatory properties and are typically more invasive than the topical prescription medications we offer. Some of the most common oral medications we prescribe are Oracea and Doxycycline. Finally, the third aspect of our rosacea treatments is lasers. We use two main types of lasers that treat the symptoms of rosacea: vascular lasers and CO2 lasers. The vascular laser primarily targets the facial redness and flushing associated with rosacea. The facial redness and flushing are caused by small blood vessels near the surface of your skin. These blood vessels are medically defined as telangiectasia. The light from the vascular laser effectively targets and penetrates these blood vessels. This results in less blood vessels near the surface of your skin, which ultimately results in less facial redness and flushing. Our second laser treatment for rosacea is the CO2 laser. The CO2 laser is designed to alleviate rhinophyma. Rhinophyma is a skin disorder characterized by a large, red, bumpy nose. It’s sometimes referred to as a “bulbous nose” and is commonly associated with rosacea. We use the CO2 laser to diminish excess swelling of the nose. The laser’s high-frequency electric current works to debulk the nose and remove any excess tissue that was caused by rosacea. If you have rosacea, diagnosis is the first step. Over time, your rosacea symptoms may become more noticeable. For example, facial redness can become permanent and your skin can become extremely sensitive to common triggers. But thankfully, we’re here to help. Our doctors and treatment options are here to help you finally become comfortable living and coping with rosacea. Schedule an appointment to get started.